A while back we ordered an appetizer at a restaurant that I wanted to duplicate. I had never cooked anything with Polenta before so this was a fun adventure. 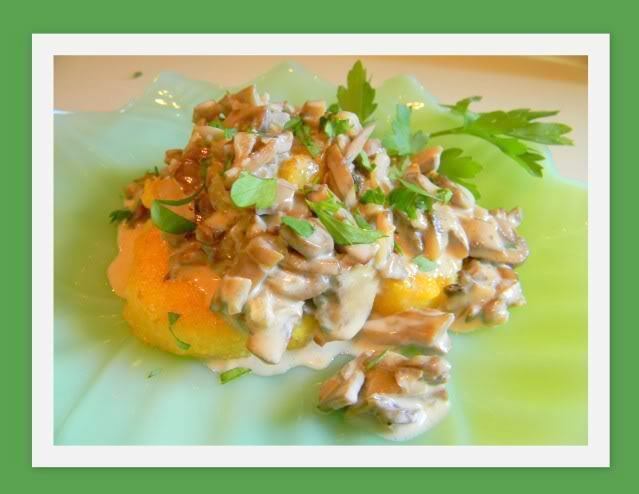 First you will want to cook the mushroom sauce and then you will saute the Polenta cakes assemble and serve. 2 Tablespoons chopped flat leaf parsley to garnish. Melt the butter over a medium low heat in a medium sized saucepan. Add the sliced shallots and saute for 3 – 4 minutes. Add the sliced mushrooms and season with salt and pepper. Stir all of the ingredients together and cook until the mushrooms have softened and darkened in color. Turn the heat up on the stove and pour in the white wine. Stir the ingredients and cook until the wine has reduced by two-thirds. Turn the heat down and stir in the cream and heat through. If you are using the Gorgonzola cheese stir it in now and heat through. Cut the Polenta into 1/2 inch thick rounds. Heat pan with Olive oil and saute Polenta over medium heat for approximately 4 minutes per side or until golden brown and crisp on the surface. To serve pour a little mushroom sauce on a serving plate. Arrange 2 slices of Polenta on the sauce and then pour more sauce over and sprinkle fresh chopped parsley to garnish. Other ways to serve Polenta: With a zesty spaghetti sauce of your choice. I’ve also seen it served fried in small cubes and used in place of croutons on a salad. Polenta is available in grocery stores in the states. I purchased this chub of Polenta at Trader Joe’s. In reading up about Polenta you can make your own using cornmeal. If you are interested in doing that just google “How to Make Polenta”. As you can see from my photo I just bought the chub that has been prepared already. Note: This mushroom sauce would be lovely over a steak or on a baked potato. This looks and sounds fantastic, Ellen! YUM. I do make my own Polenta....SO EASY. That way I can add herbs to it....or some spices and cheese. The possibilities are endless. And like couscous and quinoa Polenta is a healthier option than pasta or rice. I can't wait to try this. Oh yes - and I'd be adding the gorgonzola! I have always wanted to try Polenta but never have. What does it really taste like is what I want to know. What is the texture as you are eating it? This mushroom sauce definitely sounds delicious. It would work great with anything. Try this with dry 'Marsala' wine ... it's so good! Veal Marsala....look that recipe up...serve with the mushrooms too of course. Looks delicious! I make my own polenta as well... super easy and cheaper if you buy it in bulk. @ Amy - the texture really depends on how you cook it and the taste really depends on what you put on it. It's much like pasta in that way. The grain itself has a sort of a corn, nutty flavor... I love it! The mushroom sauce here looks divine! A great addition to the polenta for sure! I'd love to take that plate up to my bedroom and eat it by myself. Yum!